Time for Round 4 of Squash September! 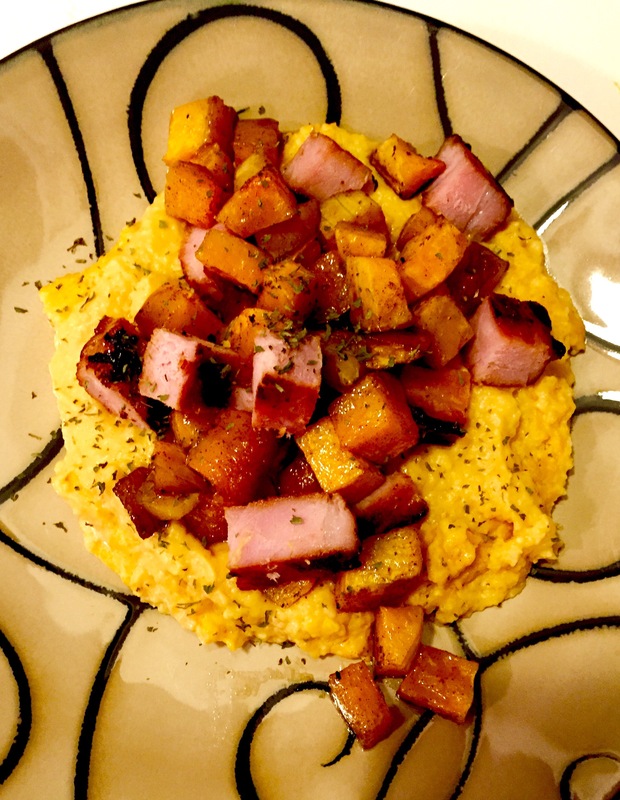 I kind of concocted this recipe with the help of Food Network Magazine’s most recent issue (October 2015); it features a recipe with pumpkin polenta—and I love me some polenta! 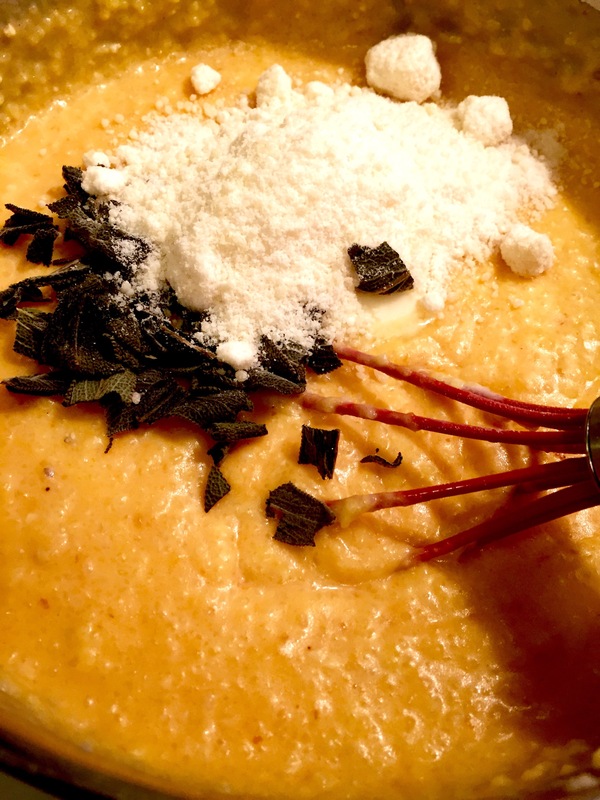 Although, I had never made polenta from scratch before…I always use the pre-made log you find in the pasta aisle. It’s delicious just slicing that stuff up and frying it in some Olive oil. This polenta, however, is much creamier. It’s akin to grits in consistency. Add some canned pumpkin, sage, parmesan & butter and voilá! A spectacular feast for a weekend supper. 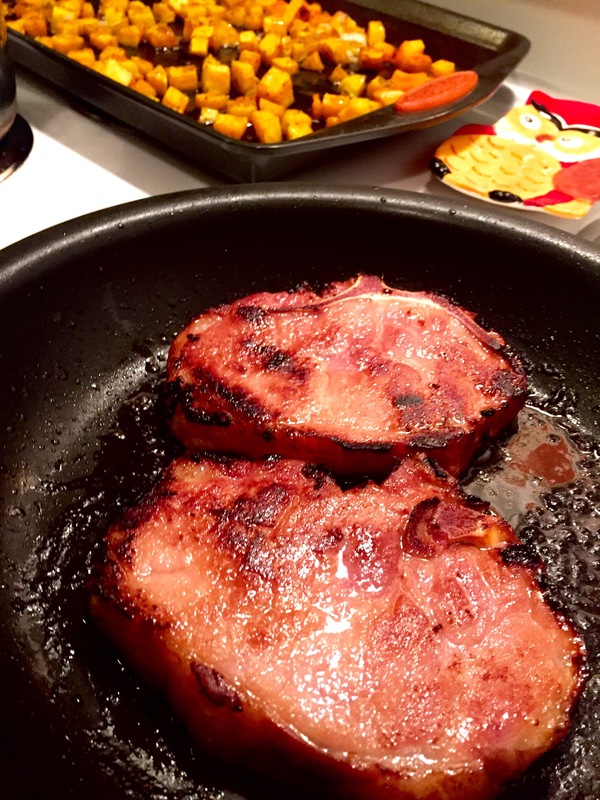 Smoked pork chops are also a new food to me. You can find them at your local butcher or in the meat aisle at the grocery store. They are fully cooked, so all you have to do is sauté in a bit of olive oil and dinner is served. It’s a nice change of pace from regular ol’ pork chops. 1. Preheat oven to 400 degrees. Toss butternut squash with olive oil & maple syrup. Season with salt and pepper. Spread in an even layer on rimmed baking sheet & bake about 30 minutes or until tender and browned. 2. Meanwhile, in large skillet, heat another tablespoon of olive oil over medium high heat. Add pork chops & cook, 4-5 minutes, until browned. 3. 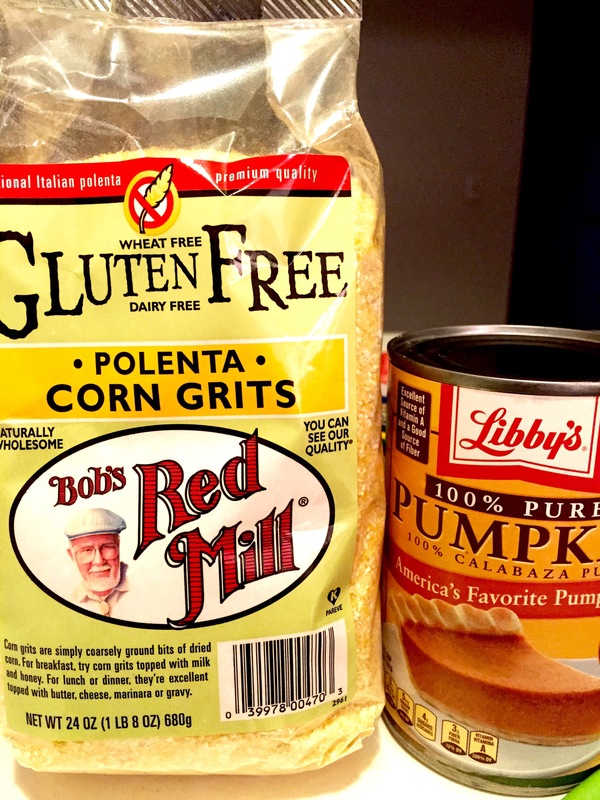 Make the pumpkin polenta: bring 5 cups water & 1 cup cream & 1/2 tsp salt to a brisk simmer in medium sized pot. Whisk in polenta, and bring to a boil, then reduce heat to low. Cook, stirring often, until creamy; about 6 minutes. 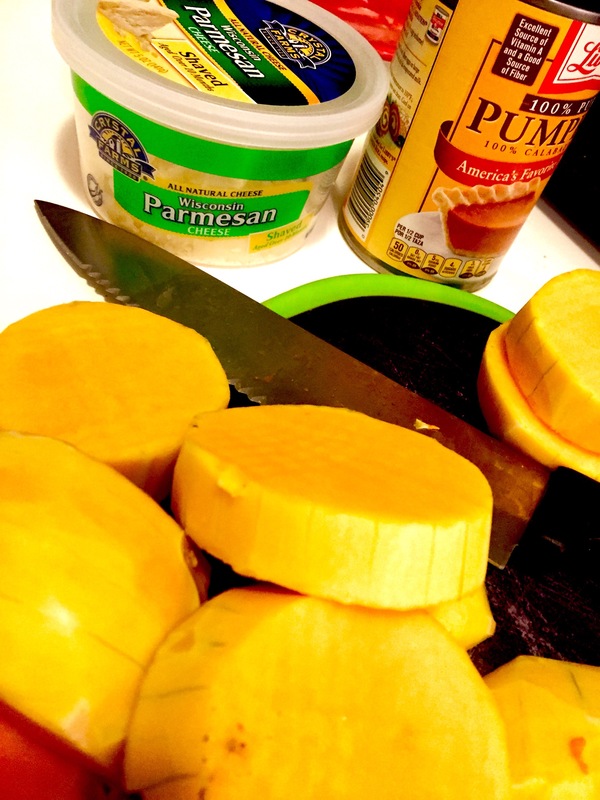 Whisk in the pumpkin & continue cooking until warmed through, about 3 minutes. Remove from heat & stir in parmesan, butter & sage. Season with salt. 4. Make the plate: first, spoon polenta onto center of plate. 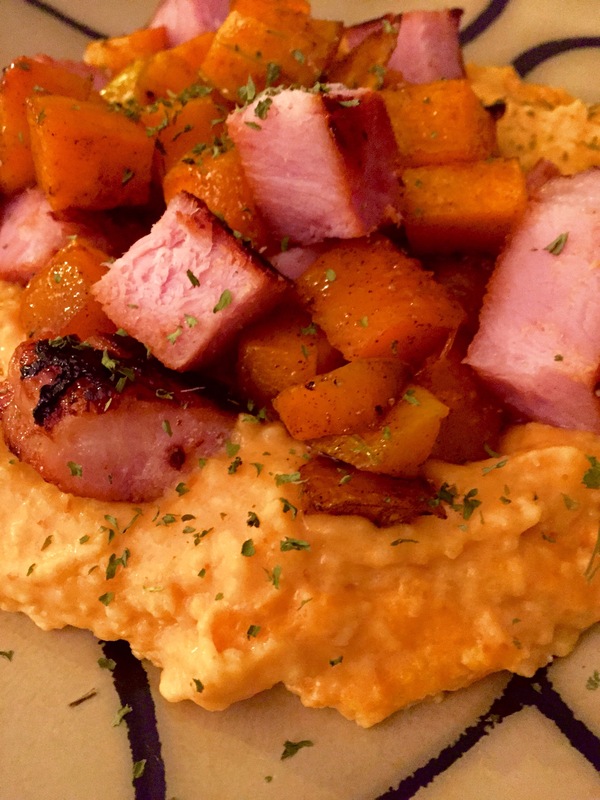 Toss pork chops with butternu squash & top the polenta with the hash. Drizzle leftover maple syrup mixture from squash pan over the top. Top with fresh sage and serve!